Pronouns – Words that are used in the place of nouns are called pronouns. ‘Pro’ means ‘for’. We use pronouns to avoid repeating nouns. Fill in the blanks with correct words in the brackets. Pinky is a doctor. ………..is very famous. 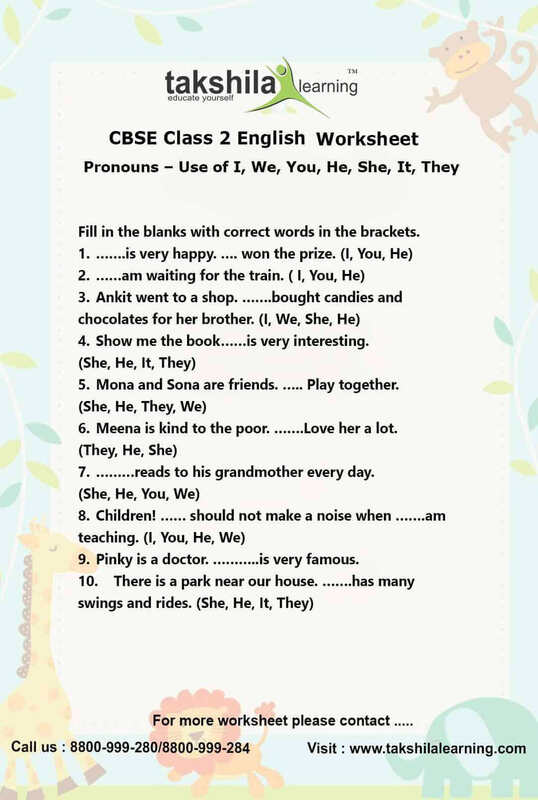 For more free Worksheets for Class 2 English click below..
Watch, understand and learn concepts of English grammar, Class 2 English worksheet, Maths, EVS, Hindi with CBSE Class 2 Video classes. Class 3 and 4 worksheets are also available at Takshilalearning. Worksheets are designed on CBSE exam pattern. It helps your ward in learning. Takshila Learning motive is to help children in their studies, so they can understand, learn and score good marks in exams. We have introduced live classes along with animated courses. Children will learn through videos and discuss with teachers through live sessions. For details log on to Takshilalearning.